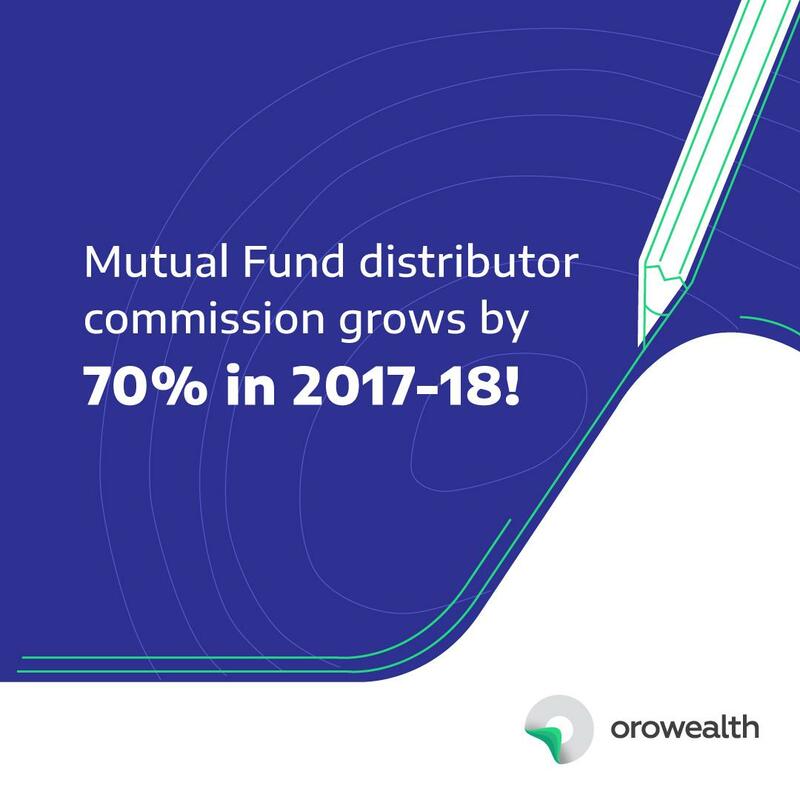 Mutual Fund distributor commission grows by 70% in 2017-18! Home > Goals & Advice > Mutual Fund distributor commission grows by 70% in 2017-18! As per the latest report released by AMFI, the total commission and expenses paid to 979 Mutual Fund (MF) Distributors year-on-year (y-o-y) grew by a whopping 70% or Rs. 3,533.3 crores in the fiscal year 17-18 to Rs. 8,533.73 crores. This growth in distributor payouts is only around Rs. 1500 crores lesser than the gross payments made to 732 distributors in the whole of 16-17, standing at Rs. 5,000.41 crores! An MF distributor is essentially the middle-man between the MF Houses and the investors, soliciting new business for the former. They could be broadly categorized as banks, companies, stock brokers, wealth managers, and individuals. These intermediaries charge investors like you a commission of around 1-1.25% per annum in addition to a fixed upfront fee in return for their advisory services. But these fees are hidden from you since they are expressed in the form of the ‘Expense Ratio’ or the cost involved in managing a fund. The table below indicates the earnings of the top ten mutual fund distributors in 17-18. The top ten distributors earned Rs. 4,237.08 crores and banks occupied eight of these positions. SBI and Axis saw more than 200% and 100% rise respectively in their y-o-y commissions, with HDFC earning the most at Rs. 641.39 crores in 17-18. Neeraj Choksi and Jignesh Desai led brokerage firm, NJ Indiainvest Pvt Ltd sits at the top of the list. Prudent Corporate Advisory Services Ltd is the only other non-bank distributor amongst the top 10 improving its position from 12th last year to 9th this year. Individuals as MF Distributors or Agents also did extremely well for themselves with Gaurav Ganpule (Rs 8.43 crore), Ganesh Shridhar Shanbhag (Rs 7.43 crore), Padam Singh Raj Purohit (Rs 6.82 crore) being the top three payees. The successful ‘Mutual Fund Sahi Hai’ campaign launched early last year resulted in the mutual fund investor folios across 42 fund houses increasing from 5.5 crores to 7.1 crores with a growth rate of 29% in the previous year. A folio number is a unique number associated with an individual investor account, though an investor could have numerous such accounts. Greater awareness saw approximately around 32 lakh new investors putting their money in mutual funds during the previous fiscal, primarily through the Systematic Investment Plan or SIP route. A large percentage of these new investors belonged to smaller towns. The increased investments saw a healthy growth rate of 26% (Rs. 4.75 lakh crores) in the Assets Under Management (AUM, i.e. the total market value of all the financial assets managed on behalf of clients) of the Mutual Fund industry. The assets rose from Rs. 18.3 lakh crores in 17-18 to Rs. 23.05 lakh crores in 16-17. In the table below, we have enlisted the AUM for the top 10 Mutual Fund houses. With the majority of the positions belonging to banks again, they seem to be the biggest winners in the mutual fund game. SBI Mutual Fund’s AUM stood at Rs. 217,650 crores, and saw the sharpest growth rate in the list with 39% growth y-o-y. The growth rate for SBI is modest as compared to its double century growth rate in the distributor rankings. From the above statistics, it is clear that the distributor earnings have risen more than proportionately to the mutual fund assets across the industry. Did you know that since a Mutual Fund distributor charges his commission as a percentage of your returns, his earnings increase along with yours! More volatile funds also attract more commission. That’s right- because they convinced the investor to buy the risky funds! Distributors also get rewarded with a higher commission for scouting investors in the ‘beyond top 30 cities’ (smaller cities) as compared to what the distributors in the top 30 cities get. Vested interests are bound to lead the mutual fund distributors to convince investors like you to purchase those products that would get them, and not necessarily you, the highest returns. If you think ‘Yeh sahi nahin hai’ (this is not right), well we think so too. That is why we help you invest in the Direct plans of Mutual Funds. If you are an experienced investor who is confident of tracking and managing your portfolio with the help of an advisor and hold a long-term view, Direct Mutual funds are ideal for you. For each Regular MF scheme, there is a corresponding Direct MF Scheme. Your Mutual Fund Distributor may have assured you that their services are “free”. But that does not mean you have invested in a Direct MF plan. You may not be writing a separate cheque for these payouts, but you are still paying them- from your mutual fund returns! When you buy a Direct plan from the Oro Wealth platform, we only charge you a fixed advisory fee and no commission. The commission savings translates to lower expense ratios, higher NAVs and hence higher returns for you. With a fixed fee format, our earnings are not dependent on yours, making our advice non-biased. So what are you waiting for? Now that you are aware of the benefits of a Direct Mutual Fund, signup on ORO Wealth to purchase the Direct MF plan suiting your needs, today! Get immediate access to over 2000 Direct Funds. You could also switch from your Regular plans to Direct Mutual Fund plans here: https://orowealth.com/switchfunds.